Hers and hers. His and his. Hers and his. All of the above; none of the above. Why limit yourself with labels, when all you really want is stunning jewelry to celebrate your union? I've made unisex rings from day one, driven by my personal experience of struggling with the gender binary and never fitting into either box. Inclusivity, visibility, and respect for all forms of non-traditional weddings - however you choose to define the term - are driving concepts behind my work at Lolide. I am committed to offering my customers a wide selection of modern, elegant engagement and wedding rings that work in countless combinations. We’re all painfully familiar with our culture’s lingering, antiquated formula for buying wedding jewelry: she gets a big rock, he gets a plain band, everybody moves on. 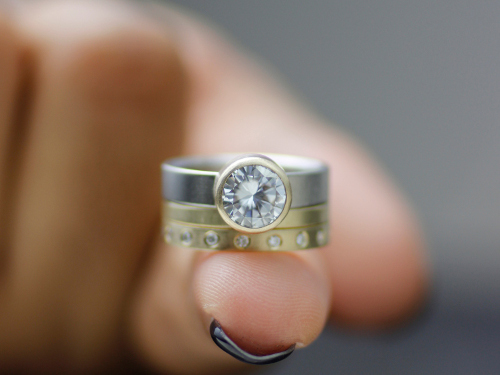 Unisex rings: these rings are for anyone who wants to stand apart from the gender constraints of traditional wedding jewelry. They’re for the woman wants something bold, modern, and strong to reflect her personality; for the guy who wants some sparkle on his finger to match the twinkle in his eye; and for non-binary folks who want to wear a symbol of love - without a gender label attached. “Men’s” engagement bands: an increasing number of my male customers are expressing interest in having engagement rings as a precursor to their big day. These are categorized as “men’s” rings due to their weight and width, but are appropriate for anyone looking for a heavier ring. Non-traditional styles: these bold rings make a statement on the hands of either, both, or all partners. Details like mixed metals, colored stones, rivets and facets mean you’ll never mistake your ring for someone else’s. "Lori's designs are sophisticated, sleek, and truly elegant. We commissioned her to make our wedding set and we were absolutely blown away when we saw the final products." "Lori was wonderful to work with. She was responsive and so helpful. Our rings surpassed our expectations. She sent samples so we were able to make a decision. We are so happy with our gorgeous wedding sets and would HIGHLY recommend her."